We all want our children to be happy. We all want them to be happy in school and it seems that Beneavin College is making sure of that. The Department of Education Inspectors recently carried out a research project in Beneavin College on the theme of wellbeing and the findings were exceptionally positive. “It was clear that the teachers in Beneavin are all student centered,” according to the inspectors from the Department of Education and Skills. “Senior management place student care as high up their list of priorities as academic achievement”. A spirit of strong relationships was found to be in place where all the staff are great role models of positive care reflecting their pastoral as well as academic role. The inspectors noted that the guiding vision of La Salle influences all aspects of school life and that the whole staff model practices that support positive wellbeing. They found, through interviewing pupils, that the students were extremely proud of the College and had a real sense of ownership. The students were hugely positive about the type of relationships that they encountered in the College with all staff. Personal qualities like perseverance, resilience and the ability to manage emotions, together with interpersonal skills such as team-working and the ability to communicate effectively are all developed in Beneavin College. The students’ academic needs are of course met, but their social and emotional growth is also a priority for the College. The inspectors highlighted how teachers “give a significant amount of their time outside of the classroom to extra-curricular activities.” The spirit of volunteerism among the teachers ensures that sports, clubs, drama, hiking, homework and breakfast clubs start and finish every day. 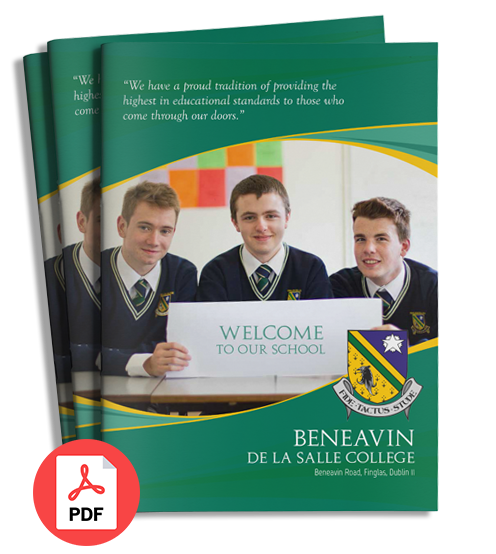 Beneavin is proud of the fact that well over 80% of the students progress onto 3rd level education and significant in this success is the fact that the students like coming to school in Beneavin. 97% of the parents surveyed said that their child was very well minded in the College and is getting on very well academically. 98% of all parents surveyed felt that their child was happy in school. Beneavin College itself, being attractive and stimulating, also really helps the positive outlook. From the assembly hall in the heart of the College to the fantastic facilities that include a movie room, music room, three science labs, two computer rooms, an engineering suite of rooms, upgraded catering facilities as well as the prospect of two all-weather pitches being in place next September. The sports department will be the envy of many as the college already has an international sized sports hall, weights rooms as well as its own pitches. The inspectors concluded that Beneavin College combines care with academic achievement very well indeed. What more could you ask for?